Lawyers for the charity previously argued the Government should have, in light of the current scientific consensus, gone further than its original target of reducing carbon levels by 2050 to 80% of those present in 1990. At a hearing on July 4, Jonathan Crow QC told the court: “The Secretary of State’s belief that he needs to have regard to what is feasible, rather than what is necessary, betrays a fundamental misunderstanding of the scheme of the 2008 Act and must be quashed. The barrister argued the Secretary of State’s “continuing refusal” to amend the 2050 target means the UK is playing “Russian roulette with two bullets, instead of one”. Taking court action to compel Governments to enforce the Paris Climate Agreement is against the real spirit of that Agreement. Controlling global GHG emissions consistent with 2°C, or 1.5°C is only an aspiration, made unachievable by allowing developing countries to decide for themselves when to start reducing their emissions. ……. Governments wanting to both be players on the world stage and serve their countries give the appearance of taking action of controlling emissions, whilst in substance doing very little. This is the real spirit of the Paris Climate Agreement. To take court action to compel a change of policy action in the name of that Agreement should be struck off on that basis. China was praised for joining the emissions party by proposing to stop increasing emissions by 2030. Very few of the INDC emissions will make real large cuts in emissions. The aggregate forecast impact of all the INDC submissions, if fully enacted, will see global emissions slightly higher than today in 2030, when according to the UNEP emissions GAP report 2017 for 1.5°C warming target they need to be 30% lower in just 12 years time. Paris Agreement Article 4.1 states something that is empirically incompatible with that aim. The Paris Agreement allows “developing” countries to keep on increasing their emissions. With about two-thirds of global emissions (and over 80% of the global population), 30% emissions cuts may not be achieved even if all the developed countries cut emissions to zero in 12 years. Nowhere does the Paris Agreement recognize the many countries who rely on fossil fuels for a large part of their national income, for instance in the Middle East and Russia. Cutting emissions to near zero by mid-century would impoverish them within a generation. Yet, with the developing countries also relying on cheap fossil fuels to promote high levels of economic growth for political stability and to meeting the expectations of their people (e.g. Pakistan, Indonesia, India, Turkey) most of the world can carry on for decades whilst some enlightened Governments in the West damage the economic futures of their countries for appearances sake. Activists trying to dictate Government policy through the Courts in a supposedly democratic country ain’t going to change their minds. Plan B have responded to the judgement. I find this statement interesting. Tim Crosland, Director of Plan B and former government lawyer, said: ‘We are surprised and disappointed by this ruling and will be lodging an appeal. ‘We consider it clear and widely accepted that the current carbon target is not compatible with the Paris Agreement. Neither the government nor the Committee on Climate Change suggested during our correspondence with them prior to the claim that the target was compatible. ‘Indeed, it was only in January of this year that the Committee published a report accepting that the Paris Agreement was ‘likely to require’ a more ambitious 2050 target. The Committee on Climate Change (the CCC) is an independent, statutory body established under the Climate Change Act 2008. The Committee is set up for partisan aims and, from its’s latest report, appears to be quite zealous in fulfilling those aims. Even as a secondary source (to a document which is easy to read) it should be tainted. But, I would suggest that to really understand the aims of the Paris Agreement you need to read the original and put it in the context of the global empirical and political realities. From my experience, the climate enlightened will keep on arguing for ever, and get pretty affronted when anyone tries to confront their blinkered perspectives. This post is part of a planned series about climate delusions. These are short pieces of where the climate alarmists are either deluding themselves, or deluding others, about the evidence to support the global warming hypothesis; the likely implications for changing the climate; the consequential implications of changing / changed climate; or associated policies to either mitigate or adapt to the harms. The delusion consists is I will make suggestions of ways to avoid the delusions. In the previous post I looked at how for the Karl el al 2015 paper to be a pause-buster required falsely showing a linear trend in the data. In particular it required the selection of the 1950-1999 period for comparing with the twenty-first century warming. Comparison with the previous 25 years would shows a marked decrease in the rate of warming. Now consider again the claims made in the summary. Newly corrected and updated global surface temperature data from NOAA’s NCEI do not support the notion of a global warming “hiatus.” Our new analysis now shows that the trend over the period 1950–1999, a time widely agreed as having significant anthropogenic global warming, is 0.113°C decade−1 , which is virtually indistinguishable from the trend over the period 2000–2014 (0.116°C decade−1 ). …..there is no discernable (statistical or otherwise) decrease in the rate of warming between the second half of the 20th century and the first 15 years of the 21st century. …..the IPCC’s statement of 2 years ago—that the global surface temperature “has shown a much smaller increasing linear trend over the past 15 years than over the past 30 to 60 years”—is no longer valid. The “pause-buster” linear warming trend needs to be put into context. In terms of timing the Karl reevaluation of the global temperature data was published in the run-up to the COP21 Paris meeting which aimed to get global agreement on reducing global greenhouse gas emissions to near zero by the end of the century. Having a consensus of the World’s leading climate experts admitting that warming was not happening strongly implied that there was no big problem to be dealt with. But is demonstrating a linear warming trend – even if it could be done without the use of grossly misleading statements like in Karl paper – sufficient to show that warming is caused by greenhouse gas emissions? The IPCC estimates that about three-quarters of all greenhouse emissions are of carbon dioxide. 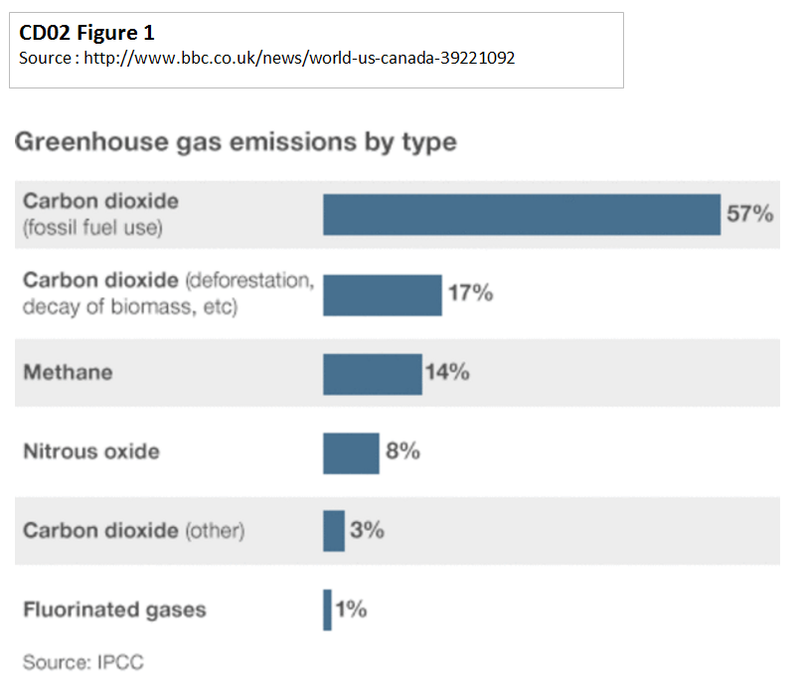 The BBC’s recently made a graphic of the emission types, reproduced as Figure 1. There is a strong similarity between the rise in CO2 emissions and the rise in CO2 levels. Although I will not demonstrate this here, the emissions data estimates are available from CDIAC where my claim an be verified. The issue arises with the rate of increase in CO2 levels. The full Mauna Loa CO2 record shows a marked increase in CO2 levels since the end of the 1950s, as reproduced in Figure 2. What is not so clear is that the rate of rise is increasing. In fact in the 1960s CO2 increased on average by less than 1ppm per annum, whereas in the last few years it has exceeded over 2ppm per annum. But the supposed eventual impact of the impact of the rise in CO2 is though a doubling. That implies that if CO2 rises at a constant percentage rate, and the full impact is near instantaneous, then the rate of warming produced from CO2 alone will be linear. In Figure 3 I have shown the percentage annual increase in CO2 levels. In every year of the record the CO2 level has increased. The warming impact of the rise in CO2 post 2000 was twice that of the 1960s. There was a marked slowdown in the rate of rise in CO2 in the 1990s, but it was only for a few years below the long term average. After 1998 CO2 growth rates increased to a level greater for any for any previous period. The empirical data of Mauna Loa CO2 levels shows what should be an increasing impact on average temperatures. The marked slowdown, or pause, in global warming post 2000, is therefore inconsistent with CO2 having a dominant, or even a major role, in producing that warming. Quoting a linear rate of warming over the whole period is people deluding both themselves and others to the empirical failure of the theory. You fail to isolate the short-term and long-term effects of CO2 on temperature. Reply: The lagged, long-term effects would have to be both larger and negative for a long period to account for the divergence. There has so far been no successful and clear modelling, just a number of attempts that amount to excuses. Natural variations could account for the slowdown. Reply: Equally natural variations could account for much, if not all, of the average temperature rise.in preceding decades. Non-verifiable constructs that contradict real-world evidence, are for those who delude themselves or others. Further, if natural factors can be a stronger influence on global average temperature change for more than decade than human-caused factors, then this is a tacit admission that human-caused factors are not a dominant influence on global average temperature change. This is the first is a planned series of climate delusions. These are short pieces of where the climate alarmists are either deluding themselves, or deluding others, about the evidence to support the global warming hypothesis; the likely implications for changing the climate; the consequential implications of changing / changed climate; or associated policies to either mitigate or adapt to the harms. The delusion consists is I will make suggestions of ways to avoid the delusions. Why is the Karl et al 2015 paper, Possible artifacts of data biases in the recent global surface warming hiatus proclaimed to be the pause-buster? Newly corrected and updated global surface temperature data from NOAA’s NCEI do not support the notion of a global warming “hiatus.” …..there is no discernable (statistical or otherwise) decrease in the rate of warming between the second half of the 20th century and the first 15 years of the 21st century. Our new analysis now shows that the trend over the period 1950–1999, a time widely agreed as having significant anthropogenic global warming (1), is 0.113°C decade−1 , which is virtually indistinguishable from the trend over the period 2000–2014 (0.116°C decade−1 ). Even starting a trend calculation with 1998, the extremely warm El Niño year that is often used as the beginning of the “hiatus,” our global temperature trend (1998–2014) is 0.106°C decade−1 —and we know that is an underestimate because of incomplete coverage over the Arctic. Indeed, according to our new analysis, the IPCC’s statement of 2 years ago—that the global surface temperature “has shown a much smaller increasing linear trend over the past 15 years than over the past 30 to 60 years”—is no longer valid. An opinion piece in Science, Much-touted global warming pause never happened, basically repeats these claims. In their paper, Karl’s team sums up the combined effect of additional land temperature stations, corrected commercial ship temperature data, and corrected ship-to-buoy calibrations. The group estimates that the world warmed at a rate of 0.086°C per decade between 1998 and 2012—more than twice the IPCC’s estimate of about 0.039°C per decade. The new estimate, the researchers note, is much closer to the rate of 0.113°C per decade estimated for 1950 to 1999. And for the period from 2000 to 2014, the new analysis suggests a warming rate of 0.116°C per decade—slightly higher than the 20th century rate. “What you see is that the slowdown just goes away,” Karl says. However, looking at any temperature anomaly chart, whether Karl. NASA Gistemp, or HADCRUT4, it is clear that the period 1950-1975 showed little or no warming, whilst the last quarter of the twentieth century show significant warming. This is confirmed by the Sks trend calculator figures in Figure 1. What can be clearly seen is the claim of no slowdown in the twenty-first century compared with previous years is dependent on the selection of the period. To repeat the Karl et. al concluding claim. Indeed, according to our new analysis, the IPCC’s statement of 2 years ago—that the global surface temperature “has shown a much smaller increasing linear trend over the past 15 years than over the past 30 to 60 years”—is no longer valid. The period 1976-2014 is in the middle of the range, and from the Sks temperature trend is .160. The trend is significantly higher than 0.097, so a slowdown has taken place. Any remotely competent peer review would have checked what is the most startling claim. The comparative figures from HADCRUT4 are shown in Figure 2. With the HADCRUT4 temperature trend it is not so easy to claim that there is no significant slowdown. But the full claim in the Karl et al paper to be a pause-buster can only be made by a combination of recalculating the temperature anomaly figures and selection of the 1950-1999 period for comparing the twenty-first century warming. It is the latter part that makes the “pause-buster” claims a delusion.